Mont Ivy exists to make a positive impact in the lives of children it touches. It is a pursuit to become the change it wants to see in the way early education is provided in India. The team believes that it possesses the necessary skills, knowledge and experience to bring about that change. Mont Ivy believes that every child has a potential to become an exceptional individual if the right input and environment are provided early on. The team believes that the learning approach adopted - particularly during early years – therefore becomes paramount in establishing the thinking and learning patterns of a child. These patterns are critical in not only shaping the personality of a child but also in determining the child’s levels of self-confidence and independent thinking. These also go a long way in governing the child's young and adult-life experiences - thereby determining one’s overall quality of life. 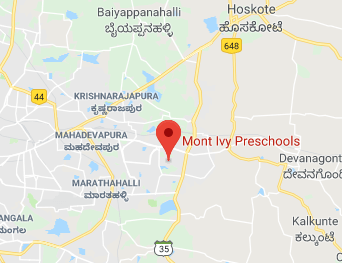 Mont Ivy, therefore follows the Montessori method of learning - a unique approach that enables a child to learn not only the academic curriculum, but also life skills. This approach focuses on learning by experiences and helps the child develop self-confidence, social skills and also foster independent thinking - making the child ready for school, and ready for life!